The Canadian Certificate in Muslim Studies project emerged in a context of interfaith friendship and Christian hospitality. Nevin Reda El-Tahry, currently the program’s coordinator, worked over the course of a year with Emmanuel College and Victoria University to invite participation from a variety of Muslim persons and organizations. Over time, the discussion included many people and spoke of a need within the Muslim community: Muslim leadership can benefit from education examining common commitments between Muslim values and the pluralistic context within Canada, and issues treated by the Canadian Charter of Rights and Freedom. 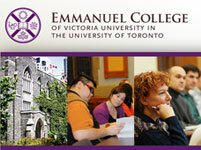 Department: Emmanuel College. A Common Word, That We May Know Each Other. By: Dr. Zijad Delic . Rev. Dr. Bruce Gregersen. Part of the Canadian Certificate in Muslim Studies.